Are you losing money each month due to hidden moisture in your home or workplace? It’s not just leaking pipes that can cause this problem. Faulty insulation system and poor ventilation may lead to moisture retention as well. Whatever the reason, moisture intruded walls, ceilings and floors can seriously damage your home or building. As if that’s not enough, water contamination in the home or workplace can result in severe health problems. Prolonged presence of moisture in a building can lead to the growth of mold and bacteria, the proliferation of wood devouring insects and the eventual breakdown of building materials. An infrared imaging camera is ultra-sensitive. Even the minutest changes in infrared radiation from various objects are easily detected. What you can’t see with your naked eye is quickly recorded by the device as a thermal image. In addition, the device can quantify thermal image. This allows us to quickly identify the exact location of moisture or leaks. Our Infrared Leak Detection equipment, allows us to identify the exact location of water leaks with needlepoint accuracy. All this is accomplished without resorting to digging or other destructive detection methods. Our cameras are capable of detecting the tiniest deviations in temperature. We will provide you a hard copy report detailing our findings so you can take quick and informed action. 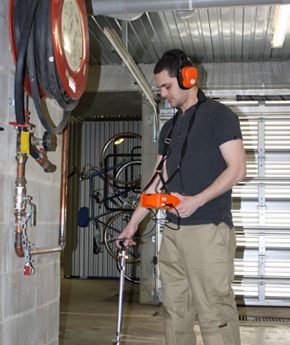 Rest assured the leak detection methods we employ are non-invasive, hassle-free and cost-effective. Water Leak Detectors is a Melbourne-based company. Our expertise and experience have brought us unparalleled success in providing effective solutions for all our customers. Undetected leaks pose a serious threat to your property’s value. Now, you can eliminate the guesswork. If you suspect any leaking pipes anywhere in your property, give us a call!